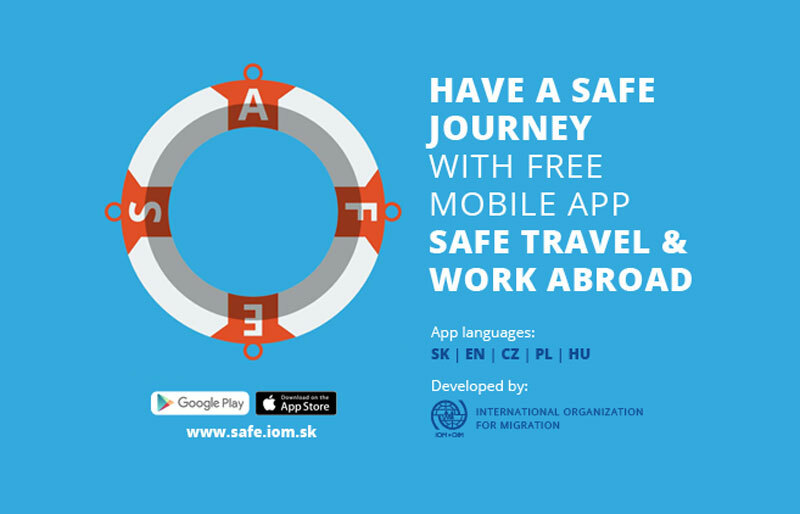 Slovakia - “Be prepared, spread the word, and recognize the signs” is the tagline of a free new mobile application called SAFE Travel & Work Abroad developed by IOM in Slovakia to raise awareness about the risks of human trafficking through an interactive game. Designed as a preventative and educational tool, the application presents a scenario where four main characters are planning journeys abroad. The app user steps into their shoes and makes decisions that will influence the direction of their lives, confronting and learning about the pitfalls of human trafficking along the way. Whether the protagonists end up travelling and working abroad safely – or fall into the traps set by traffickers – is in the hands of the player. In addition to the interactive game, the application provides vital information about human trafficking, including warning signs to look out for. It also provides tips for safe travelling and working abroad, including emergency contacts, and information on employment services and labour agreements. The app is available in five language versions: Slovak, English, Czech, Polish, and Hungarian. IOM has developed a brief companion manual for professionals working with youth on how to use the application as part of educational activities. The manual is available for free in the same language versions as the app. IOM Slovakia and its partners in the Czech Republic, Poland and Hungary are presenting the application to prevention specialists and to students to raise their awareness about human trafficking and the principles of safe travel. IOM in Slovakia has been contributing to various counter-trafficking activities since 2003. In addition to awareness-raising campaigns and training activities that are implemented in cooperation with state institutions and NGOs, IOM Slovakia provides and assists voluntary returns with pre-departure assistance for victims of human trafficking who want to go back to their home country in safety and dignity. Between 2006 and 2016, IOM identified 213 victims of trafficking in Slovakia and helped 123 of them to voluntarily return home. They also ensured that they were referred to specialized partners within National Referral Mechanisms depending on the individual needs of the person who had been a victim of trafficking. The new application was developed by IOM Slovakia as part of a project called SAFE – Smart, Aware, Free, Enjoy – Information Campaign to Prevent Human Trafficking which is supported financially by the International Visegrad Fund and the Embassy of the Kingdom of the Netherlands in Bratislava. The project is being implemented by IOM in collaboration with partner organizations La Strada in the Czech Republic and Poland, and Baptist Aid based in Hungary. The application is available for free on the App Store, Google Play and on the website www.safe.iom.sk.